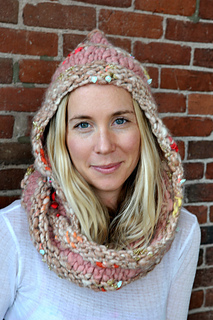 I am completely obsessed with our latest pattern- the hoodie cowl! It is definitely our most functional pattern yet, keeping your ears and neck warm and cozy at the same time. I love the pixie point at the top of the hood shape so much. In this pattern, the stitch is a stripe between our Gypsy Garden yarn & our Sister yarn. In the pics shown here, we use 1 skein Dusty Pink in Sister & 2 skeins Kinari Bazaar for Gypsy Garden. Our Rolling Stone yarn would also work instead of the Gypsy Garden. The original pattern called for 44 stitches in rows, 6, 7, 8, 17, 18 & 19. That has been changed to 34 stitches in the updated pattern to give perfect symmetry to the cowl.